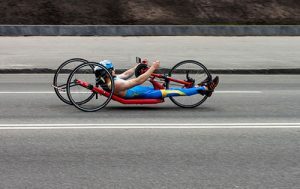 USADA announced today that Ryan Pinney, of Phoenix, Ariz., an athlete in the sport of Para cycling, has tested positive for a prohibited substance and accepted an 18-month sanction for his anti-doping rule violation. Pinney, 36, tested positive for the presence of an exogenous androgenic anabolic steroid (AAS) and/or its metabolites, which was confirmed by Isotope Ratio Mass Spectrometry (IRMS) analysis, as a result of an in-competition urine sample he provided on May 25, 2016, at the USA Para-Cycling Road National Championship. Every urine sample that USADA collects is scrutinized under an Athlete Biological Passport (ABP) program that examines levels of multiple steroid biomarkers of doping. Specific samples that exhibit atypical qualities are then targeted for more sophisticated IRMS analyses, which can reveal the presence of synthetic AAS use. The use of any exogenous anabolic agent, including testosterone, is prohibited at all times under the USADA Protocol for Olympic and Paralympic Movement Testing, the United States Olympic Committee National Anti-Doping Policies, and the International Cycling Union Anti-Doping Rules, all of which have adopted the World Anti-Doping Code and the World Anti-Doping Agency (WADA) Prohibited List. After a thorough review of the case, including Pinney’s medical records, USADA has accepted his explanation that the prohibited substance detected in his sample was contained within a prescribed medication he was taking in a therapeutic dose under the care of a physician without the intent to dope. Although an athlete may be prescribed a prohibited substance by a physician, a Therapeutic Use Exemption (TUE) is required in order to authorize the use of a prohibited substance in sport, and athletes have access to resources from both USADA and WADA that explain the TUE requirements. Under the USADA TUE Policy, an athlete has the responsibility to demonstrate in advance of using a prohibited substance that the medical need to treat an acute or chronic condition satisfies all four strict criteria within the WADA International Standard for TUEs (ISTUE). In this instance, Pinney’s TUE application was denied primarily because of the availability of non-prohibited alternatives to treat his condition. Anabolic agents like testosterone have powerful performance-enhancing capabilities and can give an athlete an unfair advantage over fellow competitors, which is why the ISTUE requires that athletes pursue permitted alternatives before a TUE can be granted for use of a prohibited substance. Pinney’s 18-month period of ineligibility began on May 25, 2016, the date his positive sample was collected. In addition, Pinney has been disqualified from all competitive results obtained on and subsequent to May 25, 2016, including forfeiture of any medals, points, and prizes.